So what's more amusing than someone dressing up a pair of stone squirrels in seasonally themed regalia? 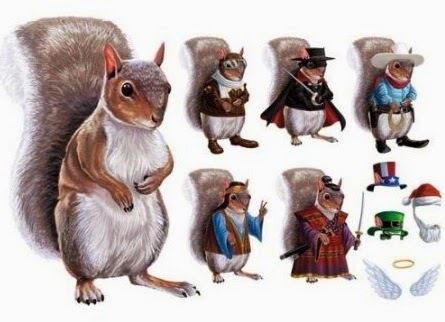 What about someone dressing up actual squirrels in seasonally themed regalia? I went to Penn State and always found the squirrels around Old Main to be unusually friendly. Not that I tried to lure them with peanuts before putting handmade paper hats on them or anything. I do remember being especially amazed by one I saw running up a huge old elm tree with an entire apple in its mouth. And I seem to recall at least one story of an especially bold squirrel climbing up on a girl's head … but I could be misremembering that. At any rate, doesn't seem a little odd that there are multiple squirrel wardrobists* running around the Keystone State? And after further investigation, I found that Mary and my neighbors have many rodent-loving predecessors -- one who was even covered in Life magazine no less. In the early 1940s, the magazine featured as story about Mrs. Mark Bullis and her adopted squirrel Tommy Tucker. "Mrs. Bullis' main interest in Tommy is in dressing him up in 30 specially made costumes. Tommy has a coat and hat for going to market, a silk pleated dress for company, a Red Cross uniform for visiting the hospital." Sugar Bush has more than 3,000 outfits and accessories and has posed for more than 5,000 photographs. After scrolling through the site I don't doubt either of these statistics. If you still haven't picked up a 2014 calendar yet, you might consider picking up one from Sugar Bush. Also, if you're in the need of a whimsical, though potentially offensive gift, order a 6-inch plush version of Sugar Bush in various costumes, including "Brokenut Mountain" Cowboy and Gnawty Nurse. As Brad noted, it seems I've stumbled down a rabbit hole … or into a squirrel's nest or something. There's a squirrel that's been visiting the bird feeder in our front yard lately. Lily likes to peek at him through our front window. She named him Rake and says he's her pet. "He's kind of crazy," she told her dad today. I haven't found Lily fashioning any miniature outfits for Rake … yet. Maybe I can tide her over with these dress up squirrel magnets. In the event that you want frequent Sneezy updates (and who doesn't, really?) be sure to follow Sneezy the Penn State Squirrel on Facebook. **Spellcheck says this isn't a word, but I say it should be a word. Say it out loud. Wardrobist. Kinda fun to say, no?